Workflow Essentials - Compliance Planning is a database system for the efficient generation of compliance documentation such as Safety, Quality and Environmental Plans. This product would suit any trade, manufacturer, builder, resource company, etc, required to regularly prepare and deliver these types of documents, or other general documents such as standard user or operational manuals. The plans are prepared from base template documents and associated components. Specific details such as organisational details, are mail-merged or loaded (via bookmarks) into copies of these templates so as to produce final project and organisational specific plans. 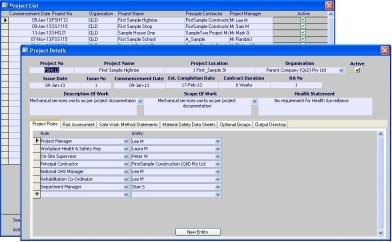 Project Managers utilise a central Project screen to locate existing plans and/or create new project plans. Details such as project title, identifiers, personnel, activities, hazards controls, SWMS's, MSDS's, etc are identified and the various plans are then auto-generated. Customisation is available to enhance the product's suitability for specific workflow and information requirements. Save a business substantial time and money in the generation of relevant documentation within job and project management. Assist with standardising such documentation across multiple project managers and in so doing, reduce the risk of copy error. Support long term project succession by ensuring a consistency of presentation and content. The ability to utilise, customise or substitute the template plans and the various source documents. The ability to import or link such documents as: company logo(s), organisational chart(s), SWMS's, MSDS's, etc. A dedicated file management component for organising your various documents. The ability to set up client jobs and/or projects, with relevant client details. An efficient approach to setting up client jobs/projects - in preparation for auto generating the associated plans/documents. The efficient auto-generation of plans and documents, with automatic version control, and the ability to re-generate after minor adjustments have been noted. Incorporate and support your own organisation's documents. Extend the type and number of supported plans and documents. Extend the type and volume of information data entered and reflected in the various documents. Extend the type and number of source documents, and the nature of their import or linking.